This is a global issue as well as a local one. When we started to build the house, we involved every aspect of sustainable development in it. That is the reason why it is important to highlight all the benefits of this highly sustainable house and estate. 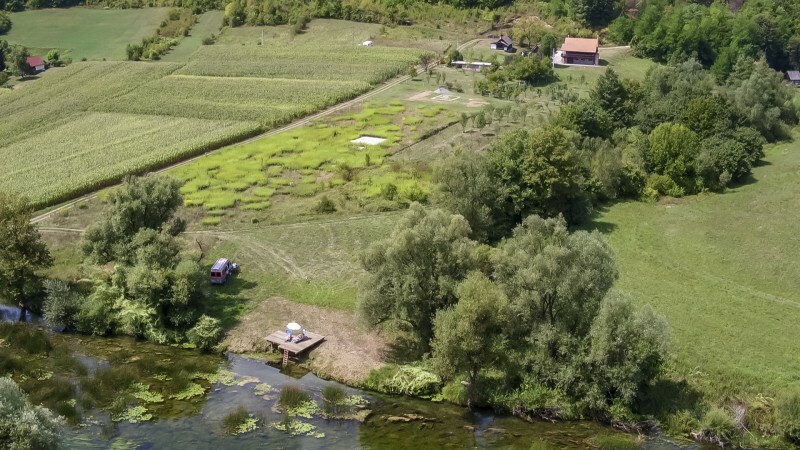 The estate is situated between city of Karlovac (25 km), and to the Plitvice lakes (60 km), UNESCO world heritage site and the oldest national park in Croatia. 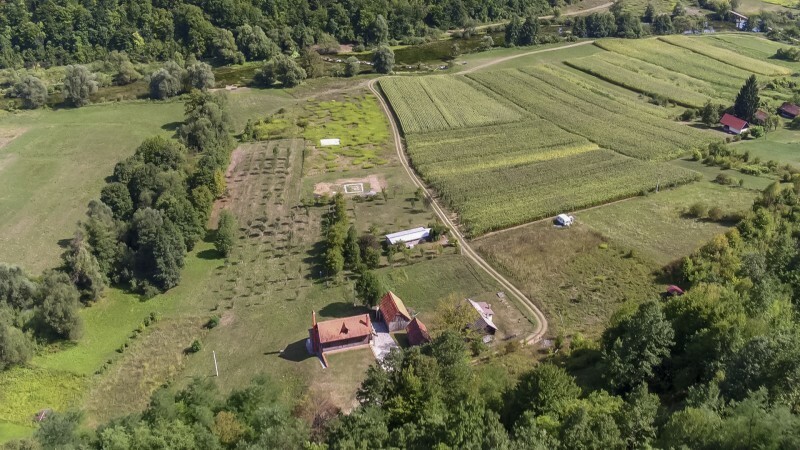 The size of the estate covers 109,053 m2 of which exactly 80,476 m2 are in one piece on the hill, while in the valley (canyon of the Korana River) there are 28,577 m2 of integral space. The distance between the two parts is about 250 to 300 meters, but they are connected by a gravel road. Part of the hilly estate is covered in forest but there are also fields, meadows and grasslands on the estate. There is also a hunting blind in the forest which could be used by hunters / bird watchers. 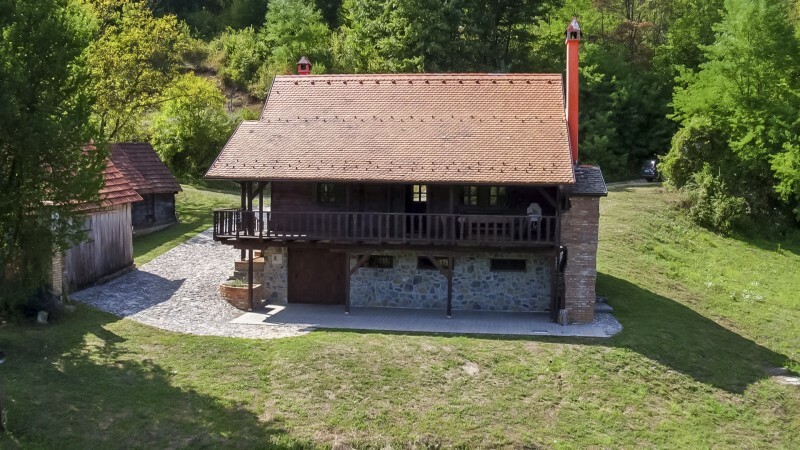 Moreover, part of the estate lies on the banks of the Korana River The access point between the river and the estate has a built wooden pier with a metal ladder, making entering the river and bathing easier. The vegetable garden covers about 1,000 m2 of space with ecological planting of some vegetables like potatoes, corn, beans, various types of zucchini, peppers, cucumbers, tomatoes, garlic and onions which are best suited for this type of land and climate. The orchard spreads on a surface larger than 6,000 m2 with over 100 fruit trees including plums, apples, pears, apricots, cherries, quinces, nectarines, currants, hazelnuts, raspberries, blackberries and other fruit. The estate is ideal for activities such as hunting, fishing, trekking, hiking, kayaking, canoeing and other outdoor activities. You can always harvest wild plants and mushrooms such as the chanterelle or the boletus during their season. The building of the rustic house has recently been finished. The house consists of wooden and stony elements that are over a hundred and fifty years old (this includes the built-in bricks and tiles). The house is a triplex object with all the elements of a modern residential house with an electrical connection, its own cesspool, natural water spring, a living room and a kitchen with a dining room, bedrooms and a cellar. Each floor has a bathroom. Blending a retro look with all the necessary modern requirements, the house is in an ideal mix of two worlds. 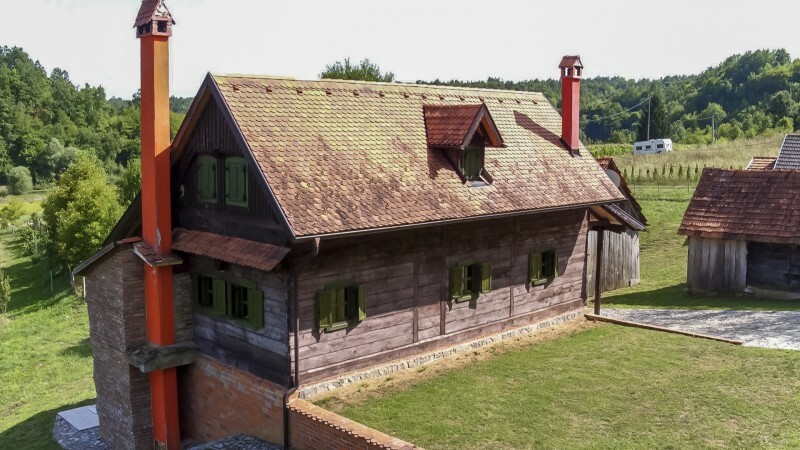 The house is unique since the used building material consists of old oak, old bricks, old roofing tile and stone for lining. The three-storey house that consists of a basement and two floors that cover 50m2 each, was coated with the latest modern insulation materials such as rock-wool. A spring with clean drinking water is situated near the house, which is directly connected with the house's kitchen. A large 50m3 tank which gathers rainwater is also an option. Heating is provided in the form of wood from the estate’s forest and electricity. The balcony covers 40 m2 and it has a built-in grill. There is a covered working area in front of the cellar that covers another 40 m2 and has an even larger built-in grill. Stairs, the railing on the balcony and all of the benches are made of old oak. The floors on the ground floor (living room) and the first floor (bedroom) are covered in rustic oak. Each floor has its own bathroom or a shower. The living room has a lovely open fireplace, and a tile stove can be found in every bedroom. You will find the unique wooden craft-work that accompanies the rustic furniture in the house. The whole house is equipped with oil paintings and drawings of contemporary Croatian artists. 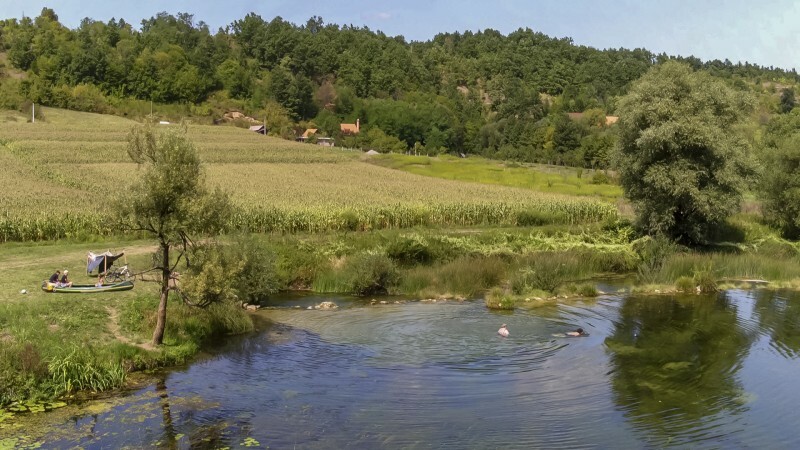 An orchard, a vegetable garden, the Korana River and a charming waterfall are all part of the view visible from the house balcony.